Yoga or Gym - Breathe Easy or Rough it Out? Browse: Home › Offbeat › Yoga or Gym – Breathe Easy or Rough it Out? 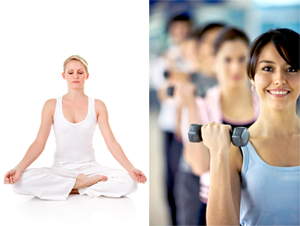 Yoga or Gym – Breathe Easy or Rough it Out? Some swear yoga is the best way to keep fit. Others say they’d collapse without the gym. Four celebrities share their experiences with both and tell us what works for them – yoga or gym – and why. The singer and actress is a yoga fanatic. It’s a holistic discipline, she says. It sculpts the body and also the mind. Frequency: I do Iyengar yoga and go for hour long classes three times a week. But I practice it at home every day for 45 minutes. Consistency is key. Weight / inch loss: I didn’t start yoga to lose weight, but my brother did. I realised that with yoga you can lose weight and also align the body. My brother saw a difference in a month’s time. Flexibility: I was a gymnast, so flexibility was never a problem. Stamina building: Within 15 days, I started to see an increase in my stamina levels. Body toning: There are asanas that target every part of your body, even shins and the back of the thighs. You can’t reach these places in a gym. You lose weight and inches and do away with flab. The body looks supple and not muscular or ripped. overall looks: It gives you a glow. Energy gain: You don’t get tired too often. Rather, you feel fresh. Healing: Yoga has asanas to cure all sorts of ailments. My father had knee trouble; after yoga, his knees have strengthened. My immune system picked up. I realised that I was completely healthy when everyone around me was catching some virus or the other. Also, I realised that onstage, while performing, because of all the breathing techniques I learnt, my lung control became great. I had face paralysis. Post yoga, I could feel my face getting back to normal. My eating habits automatically became healthy. Stress busting: I was never easily stressed. Still, after yoga, I felt calmer in difficult situations. Feel good factor: I feel happy and light. It’s a positive addiction. Yoga or Gym: Yoga takes time. But benefits start to show within 15-20 days of regular yoga practice — Parul Khanna. Though he used to play squash to keep fit, Delhi-based DJ Hamza gave it up for yoga, training under Yatharth Sehajpal. Hamza loves yoga. Its advantages are many, he says. It can be done in the privacy of his home or in the great outdoors, and when he travels, he never needs to look for a gym. Frequency: I travel a lot, which makes a daily routine difficult, but I aim for a minimum of three times a week for at least thirty minutes. Weight / inch loss: When I started nearly a year ago, I weighed 98 kgs I have already lost more than eight kgs, with a target of seven more to go. There has been definite inch loss too. Flexibility / body toning: My flabby look has gone. Muscle building: You can build muscles with yoga. After I lose another seven kgs, I can also flaunt six-pack abs. Overall looks: Friends told me I looked fat. They now tell me how nice I have begun to look. Energy gain: I feel energetic all day. Since I work late nights, I really need to be on my toes. Stress busting: Since I started meditation, I’ve lost my hyper-ness and impatience. Tensions still happen, but now I can tackle them calmly and with a lot of clarity. Feel good factor: With yoga, you feel good not just physically, but emotionally too. Paunch busting: With a little caution about what I eat, and regular yoga, I have got rid of my paunch. Yoga or Gym: Yoga may take longer than gym workout to show results, but the results are there for a long time — Veenu Singh. Though sammir has always been fitness conscious, he only started weight-training when he became an actor. He also swims, jogs and does yoga. He has tried power yoga to build his muscles. But weight and strength training work best for him, he says. That’s because muscle-building is his goal. Frequency: Weight training four times a week. Muscle building: I work on one or two body parts every day. If you need to build muscles, weight training is the most effective way. But I wouldn’t recommend heavy weights. I have realised that you can get the desired results with medium weights. Stamina building: I was a national level roller skater. My stamina and endurance levels have always been high. For stamina, I think outdoor exercise is best. I get better and quicker results running in the open for 20 minutes, than my friends who run for 45 minutes on the treadmill. Flexibility: A year and half ago, I realised my body felt stiff post a weight training schedule. Regular stretches weren’t enough to sort that out. So I started doing yoga. With that, my flexibility increased. Energy giving: I don’t gym for energy, I gym for muscles. If you want more energy, you must do cardio. Healing: Apart from the feel-good factor, I did not experience any side-benefits of hitting the gym. Yoga, on the other hand, had a very healing affect on me. Because of my constant travelling, I would often catch colds and get a sore throat. Post yoga, I had a miraculous cure. Gym workout only ups the stamina, makes me feel strong and burns calories. Stress busting: There’s nothing like yoga to beat stress. Yoga clears my mind. I get a good night’s sleep because of it. Feel-good factor: Swimming and running are draining, gym workout peps me up but yoga rejuvenates me the most. Overall looks: Like any form of exercise, gym workout makes my face look fresh. Toning/paunch busting: My paunch is quite fine. I don’t need to tone it. But exercises like sit-ups, push-ups and cardio help to tone your body. Yoga or Gym: I have been trying to get a lean muscular look for the past eight months. I have come quite close to my aim. My body can go for a month without exercise,before it starts to lose its shape. — Parul Khanna. TV actress Anita Hasnandani started working out at gym eight years ago to lose weight. Though she has done yoga, she swears by the gym, because, according to her, it delivers good results. She gyms at the Leena Mogre Fitness Academy, Mumbai. Frequency: Five days a week, 45 minutes a day. Weight loss / inch loss: My weight loss was gradual. It started with inches, then I started to lose weight too. Weight loss is an on-going process. You understand your body with time. But I have to be careful about food. For me, the results of exercise show only when I am also careful about my diet. Also, the negative side of gym workout is that you gain weight when you stop. Flexibility: I did feel more flexible after regular gym workouts. As you work out, your body opens up. Stamina building: When I started, I could only jog on the treadmill for seven to eight minutes. Now I can jog for 30 minutes without a break. Also, I feel lighter. Body toning: Toning does happen with gym workout. My problem area is my stomach. I am still trying to achieve those perfect abs. I was initially worried about looking muscular. To avoid this, I do repetitions (repeats of exercises) and light weights. With heavy weights, women tend to get muscular. Energy giving: Post exercises at the gymnasium, I feel energetic and lively. Feel-good factor: I feel good after my exercises and also charged up and excited. Also, because I have been able to lose weight, I feel good about myself. Healing: I have not had any health problems and do not have any experience of exercise helping me heal. Stress busting: I guess it is. When I feel low, a 20-minute jog makes me feel good. Overall looks: I do not have to think twice before wearing anything. Yoga or Gym: Though I have done yoga, I swears by the gym, because, according to me, it delivers good results. What should you choose – Yoga or Gym? Whether you should choose yoga or gym would depend on your goals and preferences. Choose the one that well aligns with your goals and gets well accomodated in your daily routine.